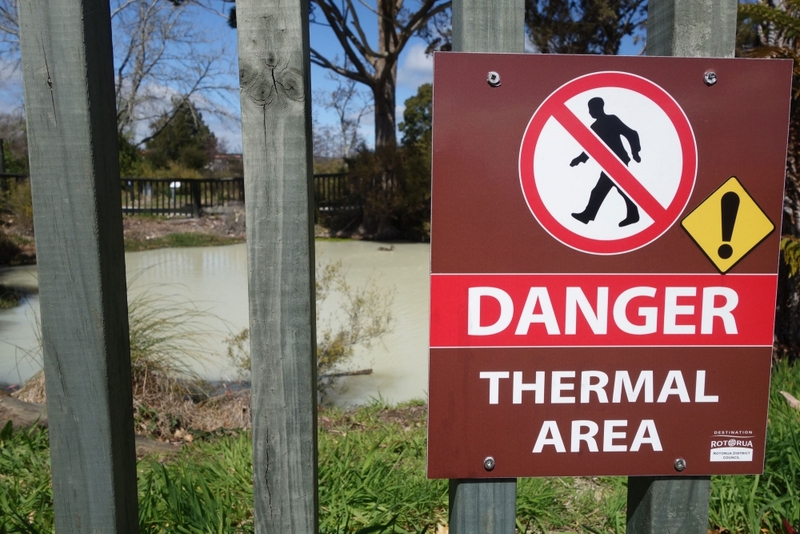 Rotorua is a strange strange place! The town is full of geothermal activity, mud pools, geysers and steam just rising from the fields around it. Due to this however, the whole place smells of sulphur aka rotten eggs. It's hard to get used to at first but by the end of your stay you hardly notice it. On our way into the town we stopped at a little place called Hamurana which is on the Northern tip of lake Rotorua. This place was fantastic for two reasons. The first was that to get to the second awesome thing, you had to walk through a Redwood Forest and never having seen them before, those things were huuuuge and pretty magnificent to see. 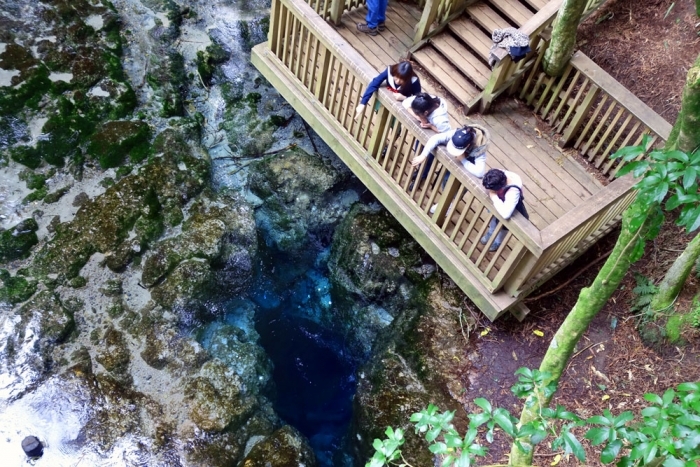 The second amazing thing in the small park was a natural spring. The water of the lake and stream was completely clear, I have never seen anything like it before. As you followed the stream upriver you eventually came to its source which was a hole in the earth and water flowing up through the hole! It was crazy - if you throw a coin into it, it doesn't sink, it just keeps twisting and twirling in the water which is flowing upwards. If you are in the area I would highly recommend stopping off to see this, it's only about 20mins one way and is completely worth it. Our first proper activity in the town was the night that we arrived - we decided to check out the Polynesian Spa. This is quite a publicised place in all of the guides to the area. Essentially they have built a spa over one of the hot springs in the town and have created lots of different pools inside of varying temperatures. 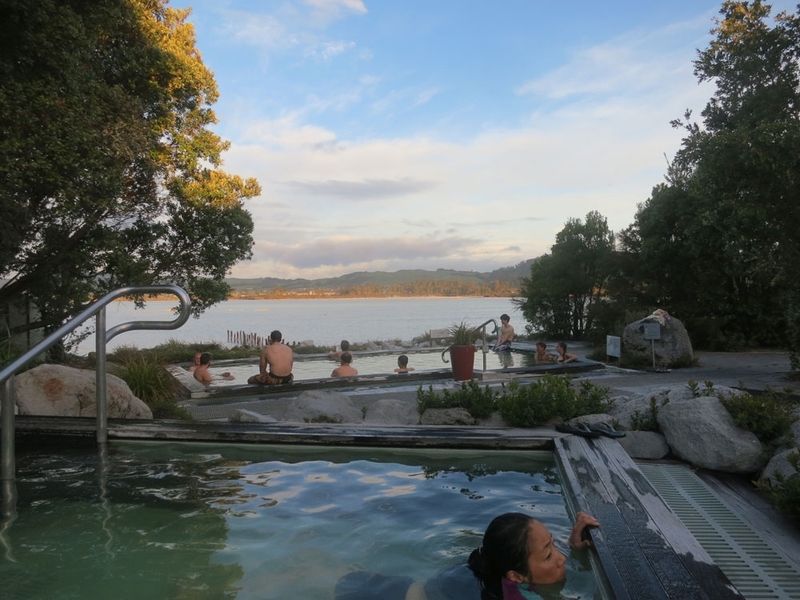 There is also a pretty view of Lake Rotorua from some of the pools. It was interesting to try, having never been into naturally hot water before but we aren't sure if it is worth the price given the free natural hot spring that we went to the next day which was awesome! The next day we decided to see Rotorua and the surrounding area for free. There are a lot of thermal parks you can visit to see geyser and mud pools and sulphur lakes but they seemed quite expensive and I feel content with what we managed to see and pay nothing at all! 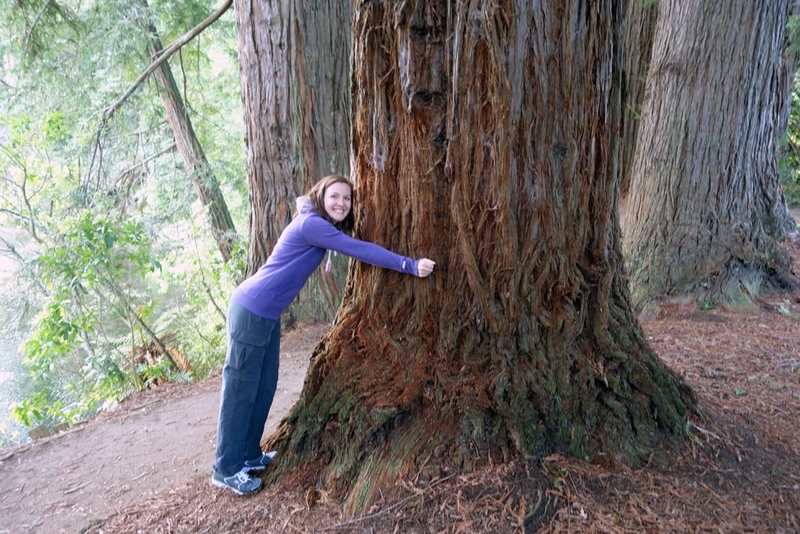 First stop was another Redwood forest (although not quite as spectacular as the first one). There is a walk in the forest from the Waipa Mill car park which will take you up a ridge and from there you can see the geyser at Te Puia going off every 30-40 minutes or so. If you go the right way it is only about 20minutes up and then back down again but we unfortunately missed our turn and ended up walking half way round the track without realising. We then hit loggers which meant we couldn't complete the track and see it that way, we had to walk back the way we came and then up the route the way we should have the first time. It is quite cool when you see the geyser though and for free, a good way to have seen one. After this we went into Rotorua itself to use the library's free wifi. On route we had a little walk about the park in the town centre (Kuirau Park) which has some sulphur pools and steaming areas. After leaving the town we headed south and made a few more stop offs on the way which were all in the vicinity of Wai-O-Tapu. The first is a place called Kerosene creek which is a natural hot spring. You have to drive down a gravel road with pretty bad pot-holes to get there but once you do it's awesome. The water is quite clear, there are warm waterfalls and the bottom of the stream is rocky so it's easy to walk on. One thing to note is that there have been a lot of burglaries at the car park in the past so just take care with leaving your valuables in the car. 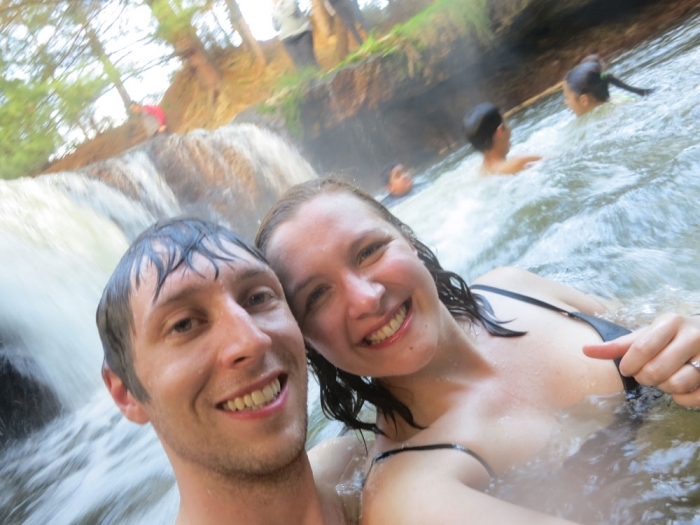 We then visited another hot spring which is slightly different because there is a hot water stream that meets a cold water spring in a swimming hole area and you can find the right level of hot/cold water for you by walking around the natural pool. We didn't like this as much as it seemed a little dirtier and the bottom of the pool was sandy and hard to walk on, but it was still a cool place to have seen. Our final stop was a mud pool which is just beside Wai-o-Tapu's main entrance. There is a separate car park and beside the car park you can look over a fence into a large mud pool. I did enjoy watching the mud plunk and plop and spirt I must say and again, it was something I had never seen before! 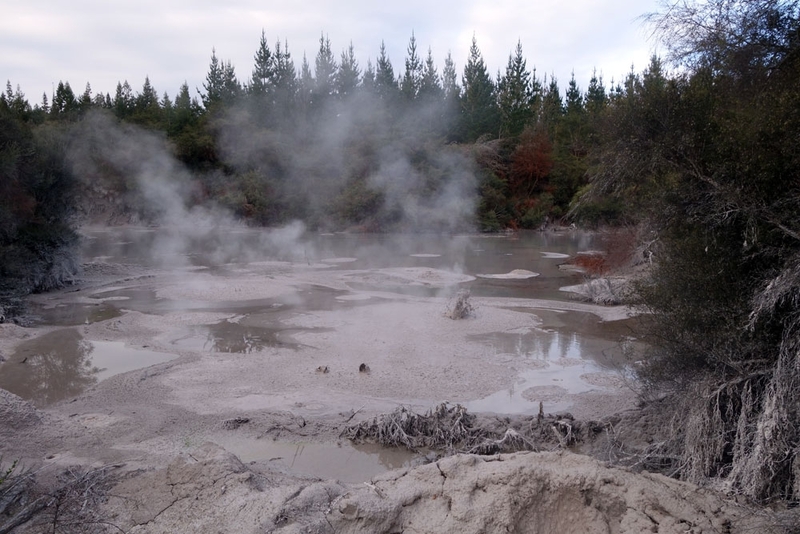 So that was how we saw some pretty cool things in Rotorua for free. After this we headed down to Lake Taupo to spend the night.